I took a trip to my local farmers market and somehow came home with 3 large bags of zucchini. Can you blame me when they were charging $2.00 for 10 zucchini? $6.00 later, I had A LOT of zucchini. Time to get creative with an abundance of one product. “Zuk” (I like to abbreviate) is easy to sneak into most meals from breakfast, through dessert. You can bake it, stuff it, grill it, saute it. Can you resist a good “Zuk” bread? The answer there is, no you can’t. Add Zuk to soups, stews, stir-fries, omelets, and cookies. It’s another one of those versatile products. Take a hint. 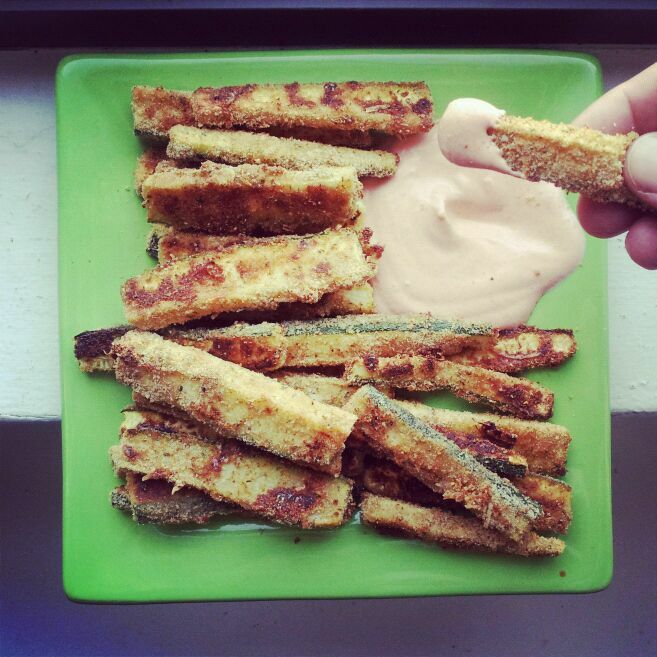 Go to your farmers market, pick up some Zuk, and make these delicious fries. Wash and cut the ends off the zucchini. To chop zucchini into 3″ x 1/2″ sticks, cut each zucchini in half lengthwise, then cut each half into thirds lengthwise. Then, cut each third in half crosswise. In a small dish (I like to use a pie plate) beat egg whites and season with a pinch of salt, pepper, and Italian seasoning. In a large zip-lock bag, combine bread crumbs and parmesan cheese. Prepare a cookie sheet by evenly spraying it with olive oil spray. Working with a few at a time, dip zucchini into egg white mixture, then place into the zip-lock bag with the bread crumb mixture. Shake to coat, and place in a single layer onto prepared baking sheet. Repeat until all zucchini are coated. Spray zucchini with another layer of olive oil spray. To make the Greek Yogurt and Sriracha Dipping Sauce, simply combine Greek yogurt and Sriracha hot sauce. Mix until well blended. The eggplants would give the fries an inner yummy goo wouldn’t it? I have sriracha sauce occasionally, I’m Thai after all haha. I was just wondering what people normally use the sauce with, just a bit surprised by its immense popularity! Basically, the only two main things Thai people eat sriracha sauce with is fried omelette and chicken, this condiment has evolved..